Sonpur is located on the west bank of the Gandak. 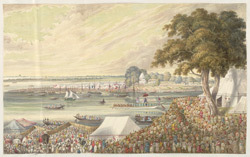 The foreground of this drawing is full of people and there are numerous boats and barges on the river including a pinnace budgerow with an English couple seated on top. The temple of Mahadeva can be seen on the opposite bank with a large encampment, and beyond is the Ganges, also thronged with people. The great granary at Bankipore is visible in the distance.